Three research groups in the Department of Chemistry received substantial grants to the value of R4,55 million. The funding includes bursaries for students and post-doctoral fellows, mobility grants, running costs and equipment support, as well as dedicated funds for two young scientists in the UFS Prestige Scholar Programme, Drs Lizette Erasmus and Alice Brink. The funding comes from Sasol, the THRIP programme of the National Research Foundation (NRF) and PetLabs Pharmaceuticals for the overarching thrust in Organic Synthesis, Homogeneous and Heterogeneous Catalysis. The programme has a broad focuse on different fundamental and applied aspects of process chemistry. 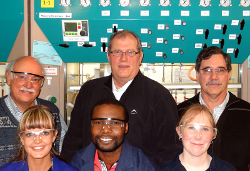 Research groups of Profs Andreas Roodt (Inorganic), Jannie Swarts (Physical) and Ben Bezuidenhoudt (Organic / Process), principal members of the focus area of (Green) Petrochemicals in the Materials and Nanosciences Strategic Research Cluster (MNS Cluster) will benefit from the grant. This funding was granted based on the continued and high-level outputs by the groups, which resulted in more than 40 papers featuring in international chemistry publications in merely the past year. A few papers also appeared in the top experimental inorganic chemistry journal from the American Chemical Society, Inorganic Chemistry. These high-impact papers address important issues in catalysis under the UFS Material and Nanosciences Research Cluster initiative, as well as other aspects of fundamental chemistry, but with an applied approach and focus. Prof Andreas Roodt, Distinguished Professor and Chairperson of the Department of Chemistry, said the grants will enable the three research groups to move forward in their respective research areas associated with petrochemicals and other projects, and enable additional students in the department to benefit from it. It will also ensure that these groups can continue and maintain their research on different molecular and nano-scale materials. Current experiments include conversions under extremely high gas pressures (typical 100 times that in motor car tyres). This takes place at the molecular level and at preselected nano-surfaces, to convert cheaper feed-stream starting materials into higher value-added products for use as special additives in gasoline and other speciality chemicals. The funding support forms part of the Hub-and-Spoke initiative at Sasol under which certain universities and specifically the UFS Department of Chemistry have been identified for strategic support for research and development. The department and the UFS gratefully acknowledge this continued and generous support from all parties concerned.